I have a five year old daughter. Which means I’ve lost count of the times I’ve seen Frozen, let alone the times we’ve sung along to the soundtrack. I also have an almost two year old daughter, so there’s no sign of this trend letting up any time soon (plus sequels…). Frozen is, for all its ear worms, a great movie. It’s not just a great movie for girls — though it is that; featuring strong female protagonists, no salvation-through-prince-charming narrative, ‘true love’ found in the context of family, and a brave questing heroine in Anna. Frozen is a great movie for boys too (and not only because it presents girls as something other than a prize). I’ve been trying to convince my oldest daughter that her first take (and many subsequent takes) on Frozen have been wrong. I’m almost there. Now I’m going to try to convince you. Elsa is not the most powerful hero in Frozen; she’s the powerful villain who is ultimately redeemed. Anna is the more powerful hero, who follows the conventional hero’s journey, and she is the redeemer who sacrifices herself in an act of true love; demonstrating that love, in fact, is more powerful than the weird genetic ability to make ice, and so, both sacrificing herself for Elsa in order to save her, while also redeeming Elsa, unlocking a more powerful (less broken) version of herself, and giving her the example she needs to bring life not death to their kingdom. It’s a shame that Elsa gets so much more attention in the merchandise, and the more compelling anthemic songs to sing (and to have sung over, and over, and over, and over again). The songs in Frozen are an interesting window into our world’s problems when it comes to stories (and why my daughter was harder to convince than she should be of this thesis). Songs are a pretty great ‘long tail’ revenue raiser for a movie, for most people they exist in the imagination (and a long time after the story), and the more they are removed from the story the less of their original meaning and context they retain. Somehow, Let It Go has become a sort of liberating anthem for girls who have, for too long, been told ‘conceal, don’t feel, don’t let your powers out, put on a show’ — and there are absolutely things in this narrative in Elsa’s head that are villain creating — but according to the movie, Let It Go is not redemptive… it’s destructive. It’s where Elsa locks herself alone in the centre of an ice kingdom with a deadly monster who almost kills the sister who came to save her. It’s part of her path to redemption, part of her journey, but not its end. In the end we learn that Anna has had the key all along (though she too has had to learn to channel her powers and not focus them with great and inappropriate intensity on everyone)… Love is an open door. She was just, in terms of her journey, singing it to the wrong person — projecting years of being shut out from loving her sister onto the first person who offers ‘an open door’ (so here’s a hot tip for parents out there trying to learn something from Frozen… please don’t close the door, please don’t tell your kids not to feel, to conceal who they are out of fear… model health. And probably don’t both drown on a ship in a storm). Anyway. Anna’s heroic journey teaches her something more about love; she is forced to question whether the story she built for herself with Hans is fact or fiction, and it’s not just Kristoff’s words that challenge this, but his very existence (and his own ‘open door’ policy of simply speaking his mind and challenging her bad decisions), their interactions with the ‘love experts’ (and it’s pretty clear the trolls have a fairly limited understanding of human love — as marriage/romantic love — and that they gave some pretty bad and damaging advice to Elsa early on in the piece), and the unconditional love she receives from a snowman (who’s something of an avatar of the last time she really felt loved by her sister (a symbol, in part, to some of her longings in Do You Want To Build A Snowman, but also a sign that Elsa hasn’t totally forgotten that moment of joy and love they experienced before the door closed, and before the gates closed). Anna becomes the hero a bit by accident. She goes looking for a redeemer who’ll thaw her frozen heart, and in the climactic moment of the movie she runs in front of a sword meant for Elsa — a sword of judgment — and takes that sword upon herself. And in that act of sacrifice — she unthaws Elsa’s frozen heart. And they all live happily ever after. Love is the real power in Frozen, and loving sacrifice the real path to building the kingdom of Arendelle. When you watch Frozen this way it’s a great story. A powerful story. A story we should want capturing the imaginations of our daughters and sons (not just the songs)… it’s a story very much like the Gospel story. The Gospel is like Frozen, but better. It’s better because, as J.R.R Tolkien said, it’s a ‘true fairy tale’. 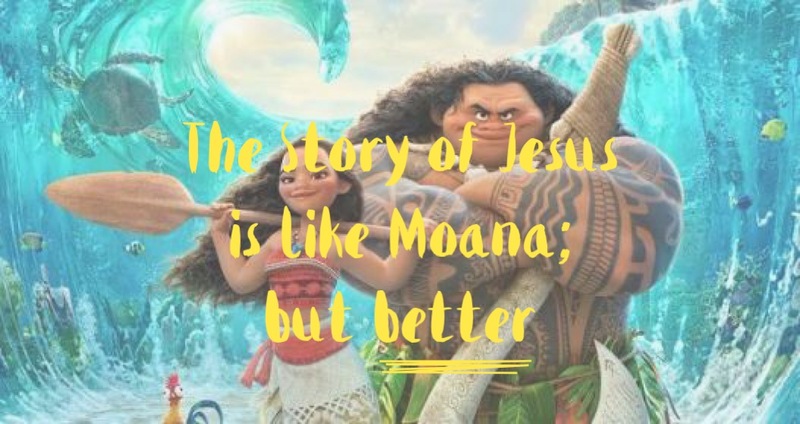 It’s better because the sudden and unexpected happy ending — the thawing of our frozen hearts — the beating of Jesus’ heart after death, and the redemption of our own icy villainous hearts is true; not just an animation. It’s better cause we have better songs connected to the story. The story of the Bible is something like the story of Frozen. We humans get bad advice early on (from a serpent, not a troll). We ‘close the door’ on God, and ‘ice’ claims our hearts. We become cold, where we were made for love we forget how to love, and in some ways we forget that love is important to give for anything other than selfish reasons. We spread that ‘coldness’ around us, even though we know it’s bad for people, when we just decide to ‘let it go’ — when we pursue our own ‘kingdoms’ by letting it go, and being true to our hearts, it’s bad and isolating for us, and dangerous to others. We are like Elsa. We need redemption. It’s true that in the movie, ice can also be used to create beautiful and redemptive things, so it’s not a perfect metaphor for sin, it’s more our humanity apart from God, and a re-connection with God, in the Bible’s story, re-animates this humanity so that we make beautiful and good things again. Jesus is like Anna. But better. He doesn’t need to be taught about his power, love, and how to use it. He doesn’t accidentally become the hero at the end of the story because of what has been latent in him all along. He doesn’t misfire, and he doesn’t drive us away or make us fear what life looks like when we embrace our true power (love). He doesn’t have ice in his veins, but he does lay down his life and take an icy blast from us. The utter evil misdirection of our icy fury. Where Elsa kills Anna, we kill Jesus. And yet. Jesus lays down his life for us. To save us from the swinging sword of judgment. It’s actually not the sword that kills Anna; the ice Elsa blasted her with finally freezes all of her, and her icy death — her frozen body — turns the blow aside. Jesus is like Anna because he shows us that true love is ‘laying down one’s life for one’s friends,’ Jesus is like Anna because he takes on our ‘icy mess’ and uses that moment not just to save us from the sword of judgment, but to redeem us — and thaw our hearts — providing new life for us and an example to follow. And we have a song to prove it. Philippians 2, where Paul talks about what it looks like to live following Jesus. He tells us the story of the Gospel in what is held to be an early Christian hymn. This is the song I want my kids singing, and because Frozen is like the Gospel, I think it’s a great bit of ‘media’ to use to bring some of these ideas to life. Nathan loves stories. He gets to tell the greatest story in the world — the story of Jesus — as a job, and to his kids. But he also loves how many other stories help us see and feel our way through the world. And Like But Better is a way to bring these loves together. Like But Better is a website devoted to stories, and to exploring how the stories in our world connect us to the story of the world. We believe that story is the story of Jesus, and his story is like, but better than, all other stories about life, the universe, and everything.